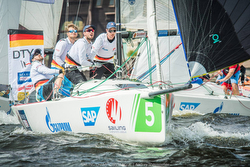 (Berlin, Germany)- Thirty-six teams from both the 1st and 2nd Levels participated in the fourth round of the German J/70 Sailing League at the club Seglerhaus am Wannsee. As anticipated, the Wansee Lake was a challenge for the 36 clubs; the teams fought hard over the three days with spinning winds, sun, rain, and difficult conditions. After 48 races (16 for each club), clubs from Hamburg were at the top of the podium for the second time in a row, but the outcome was made in the last race. The Norddeutscher Regatta Verein (NRV) and the Mühlenberger Sailing Club (MSC) defended their places at the top of the leader table. By winning seven of their sixteen races, it was quite clear that NRV was sailing in a league of their own. Only Dusseldorf YC challenged them in most races, winning five races on their way to securing a second on the shifty lake. Third went to Bayerischer YC, fourth was Wurttembergischer YC, and fifth was Wassersport-Verein Hemelingen. As result, for the 1st level, NRV are counting a 1-8-1-1 for 11 pts to lead the series by 8 pts. Second with an 8-5-2-4 tally for 19 pts is Wurttembergischer YC, and third is Bayerischer YC with a 2-7-10-3 for 22 pts. 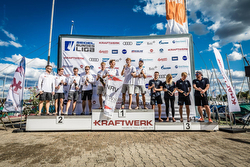 Sailing photo credits- Lars Wehrmann For more German J/70 Sailing League information Add to Flipboard Magazine.